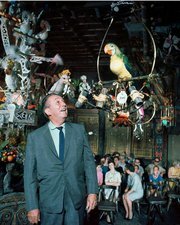 “Ray Bradbury on how Disneyland humanized robots” by Lauren Davis on io9.com. Embedded within this article on io9 is a link to an article Ray Bradbury wrote on the feats of Disneyland, particularly in the area of robotics. Some people, he claims, compare Disneyland to Las Vegas. He visited both, and reported that they are far from the same. Here is his article, “THE MACHINE-TOOLED HAPPYLAND” – October 1965. U Penn musical robots playing James Bond theme song. Wired article, “TED 2012: UPenn Flying Robots Play a Mean Keyboard” by Mike Isaac. “Autonomous Flying Robots Flock Like Birds” by Danielle Venton.